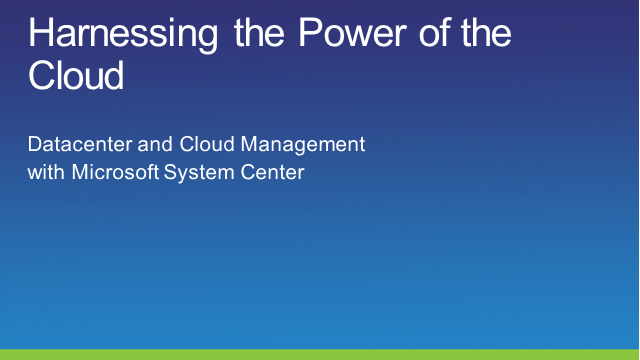 Join us for an overview of: how Microsoft can help IT operations evolve to embrace cloud computing; how you can enable the efficiency and flexibility of the private cloud; and how you can optimize, secure and manage your data center. Learn from key management executives how Microsoft's cloud and data center vision will be enhanced over the next 18 months, with upcoming releases and additional enhancements to the products you use today including: Operations Manager, Virtual Machine Manager, Service Manager, Configuration Manager and Opalis. Gordon McKenna is a System Center Operations Manager MVP and one of the world’s leading experts in Microsoft Management Technology with over 15 years’ experience in the space. Gordon is one of the best known speakers on System Center doing the circuit, regularly appearing at TechEd both in the UK and the US as well as being a regular speaker at MMS, WPC and numerous partner and community events. Gordon now runs one of the UK's leading System Center consultant practices and his team are responsible for some of the largest roll-outs of the technology in EMEA. Gordon McKenna, CEO & System Center MVP, Inframon Ltd. Presented by: Gordon McKenna, CEO & System Center MVP, Inframon Ltd.